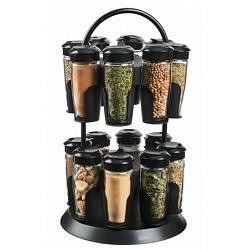 This spice carousel from Trudeau comes with 16 prefilled spice bottles and features a space saving design. The spice rack allows you to turn both the up and the downstairs so you are able to quickly grab which ever spice you are looking for. The spice containers are made from glass to preserve freshness.